SWISS International Air Lines has apparently decided to fully engage in a price war with easyJet try to gain back market share it has gradually lost to the LCC. Switzerland’s de facto flag carrier has started offering low-cost flights starting at CHF49 (EUR40/USD51) from Geneva to a number of popular destinations such as Madrid and Nice. Athens and Prague are to follow from mid-Sep-2012. The price offensive is a test phase and will run until 31-Dec-2012. SWISS still holds a leading position at Zurich Airport, its home base, but the airline that prides itself on its high standards and an impeccable service approach has lost ground to LCCs, primarily easyJet, at the country’s second largest airport Geneva. easyJet is also the largest operator at Basel/Mulhouse EuroAirport with a near 50% share of capacity expressed in seats and 40% of flight movements. The decision by SWISS follows a survey among passengers revealing that they want the “most attractive prices” and more flexibility. SWISS’ realisation is not surprising, to say the least, as passengers have been switching to no-frill carriers for short and medium-haul in Europe for more than a decade. Passengers have been making the switch not on the basis of the excellent service LCCs provide, but low fares or the perception of low fares. The survey results were disclosed by the airline’s head of marketing for Switzerland Thomas Benz told Swiss trade magazine Travel Inside. Data by ELFAA (European Low Fares Airline Association) for the 12 rolling months through Jun-2012 reveal that its member airlines increased passenger numbers 5.6% on the year-ago period to 193.7 million and average load factor inched up 0.4% to 82.3% whilst the number of aircraft deployed by ELFAA member airlines increased by 6.3%. 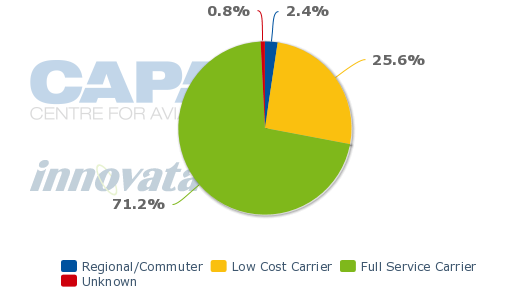 Market penetration of LCCs in Switzerland is among the lowest in Europe and stands at about 26% in terms of seat capacity available on international routes, based on schedules in Innovata for the week of 03-Sep-2012 to 09-Sep-2012. Only the Netherlands and France have done better in keeping LCCs at the door. Budget operators in the Netherlands have a 24% capacity share, while their share in France stands at 25%. That contrasts with some southern European countries have seen the seat capacity share of LCCs expand to half of total capacity. 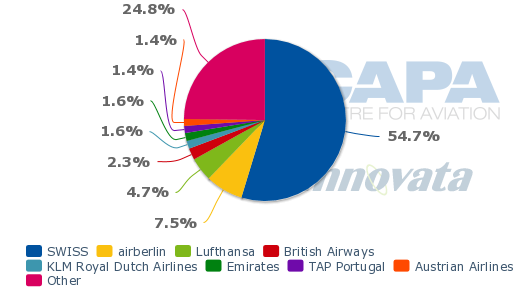 LCCs fly 56% of all seats in and out of Spain and 46% of all seats in and out of Italy, according to OAG. easyJet is the only non-Swiss LCC to have a base in Switzerland. It entered the Swiss market initially through easyJet Switzerland, which was established in May-1988 as TEA Basel, but recently most flights have been taken over by easyJet. easyJet and easyJet Switzerland operate under different Air Operator's Certificates (AOC). easyJet Group took a 40% interest in TEA Basel and started operating franchise flights for easyJet one year later. Currently, easyJet Group has a 49% interest in easyJet Switzerland S.A. with an option that expires in 2014 to acquire the remaining 51%. easyJet Switzerland, however, is consolidated as a subsidiary on the basis that easyJet exercises a dominant influence over the undertaking. Switzerland is not a member state of the European Union but it has a comprehensive air transport agreement with the bloc, giving EU carriers unrestricted access to Switzerland and vice versa. The country is part of the borderless Schengen area with 62% of the country’s capacity flown within the Schengen area. SWISS remains the leading carrier of Switzerland with an approximate 35% share of seats deployed on international routes. When factoring in the capacity of Lufthansa and Austrian Airlines, which like SWISS are fully owned by Lufthansa Group, the capacity share rises to 42%. easyJet is the country’s second largest single airline, with a capacity share of around 17% on international and system seats. Domestic air traffic in Switzerland is limited and represents less than 2% of total seat capacity and 0.2% of system ASKs. 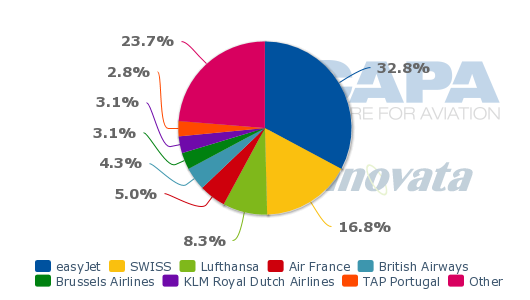 SWISS has managed to protect its home base from low cost penetration, with budget carriers representing less than 13% of system seats offered from/to Zurich airport, according to schedules in Innovata for the week of 03-Sep-2012 to 09-Sep-2012. NIKI is the low-cost carrier offering the most seats to/from the airport and has a 1% share of total seat capacity deployed at the airport. Vueling Airlines is the LCC offering the widest network from/to Zurich Airport with just three destinations: Barcelona El Prat, Paris Orly, and Santiago de Compostela. easyJet offers only two routes, to London Gatwick and London Luton. It used to operate from Manchester, but pulled the service in Mar-2012 after one season. easyJet’s low presence at Zurich Airport contrasts sharply with its leading position at two other of the country’s airports, Geneva and Basel/Mulhouse EuroAirport. In a recent interview with the Swiss newspaper Der Sonntag, easyJet CEO Carolyn McCall described Zurich Airport as a “well-functioning airport” but it is too expensive. Ms McCall criticised the policy of the airport operator for requiring the use of aerobridges while easyJet passengers “do not mind walking from the aircraft to the terminal” and charging huge amounts for the use of check-in counters “which soon will be superfluous”. Nevertheless, Ms McCall sees great growth opportunities in Switzerland. The GDP growth has been downgraded from 1.8% to 0.8%, but the Swiss economy is still expanding in contrast to the GDP contraction or economic recession in several EU countries. Switzerland is a main market of easyJet and one of its three top growth markets with an annual growth rate of 10%, according to Ms McCall. The airline has 12 aircraft based at Geneva Airport and seven at Basel/Mulhouse EuroAirport and this could further grow in the near future, Ms McCall indicated. The LCC will, for now, not expand at Zurich Airport, yet it intends to break SWISS’ monopoly on the Zurich-Brussels route by introducing a six times weekly EuroAirport-Brussels service on 28-Oct-2012. easyJet has a market leading position at Geneva Airport. The airline flies some 118,000 seats to and from the airport, which is more than twice the 58,100 seats offered by its full-service counterpart SWISS, according to schedules in Innovata for the week of 03-Sep-2012 to 09-Sep-2012. In terms of market share of network-wide seats, easyJet holds a 33% share and SWISS a 17% share. SWISS and Lufthansa jointly have a 25% market share. The LCC’s lead position is even more pronounced when considering only international flights, with easyJet having an approximate 35% capacity share of seats and SWISS a 13% share. easyJet operates some 726 weekly international flights to/from Geneva Airport and SWISS 348. Despite easyJet’s large presence at the airport, Geneva remains a largely FSC dominated airport. LCCs represent 33% of the airport’s weekly seat capacity whereas full-service airlines have a 65% share. Other no frills airlines operating at the airport include Norwegian Air Shuttle, which flies from Oslo, Copenhagen and Stockholm-Arlanda; Jet2.com which connects the airport with Belfast, Leeds/Bradford, Manchester and Nottingham. Flybe operates from Exeter, Isle of Man, Jersey and Southampton, while Turkey’s Pegasus serves the airport from Antalya. easyJet serves 56 non-stop scheduled passenger destinations from Geneva and SWISS 12, of which one is long-haul (New York JFK Airport) and one domestic (Zurich), according to schedules in Innovata for the week of 03-Sep-2012 to 09-Sep-2012. SWISS competes with easyJet on seven destinations. EuroAirport Basel/Mulhouse-Freiburg is an unusual airport as it is located near the borders of Switzerland, France and Germany, serving the three cities of Basel, Mulhouse and Freiburg. The airport is located entirely within French territory, but it is operated jointly by France and Switzerland, with a governing board comprising members from Switzerland, France and Germany. easyJet in Jul-2011 threatened to close its base at the airport over lingering discussions regarding French vs Swiss traffic rights. easyJet widely regards Basel/Mulhouse EuroAirport as a Swiss airport and it asserts it can use the airport for non-EU flights because it operates under a Swiss AOC. The LCC offers flights to Istanbul Sabiha Gokcen, Pristina and Tel Aviv-Yafo Airport. Israel and the EU have since concluded an Open Skies agreement. easyJet has a dominant market share at the airport. It produces almost half of the total seats flown to/from the airport and operates about 40% of all flight movements. 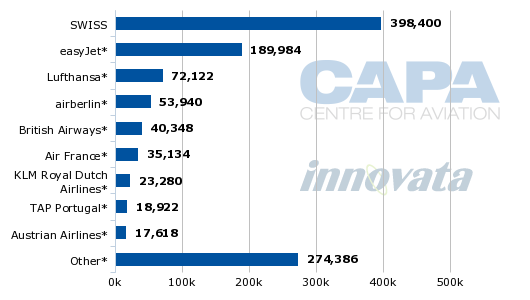 The remaining capacity is fragmented and LCCs have an approximate 62% share of seat capacity, according to schedules in Innovata for the week of 03-Sep-2012 to 09-Sep-2012. SWISS has a declining presence at the airport and presently operates only five routes from Basel/Mulhouse EuroAirport. 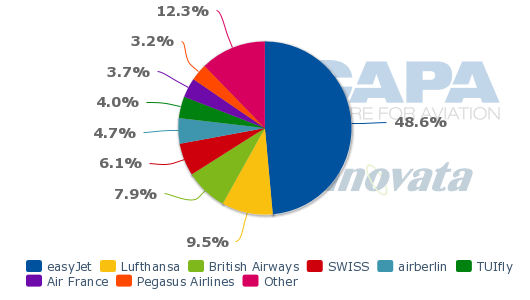 SWISS and its German sister airline Lufthansa have a joint 16% share of weekly seat capacity. easyJet operates to 37 gateways from the airport. It will add several new routes in the IATA northern winter 2012/13 timetable, including a six times weekly to Brussels Airport, a four times weekly service to Budapest, a twice weekly to Santiago de Compostela and a four times weekly to Manchester. The increased presence of easyJet in Switzerland will further erode SWISS’s market share on short and medium-haul. SWISS had a sudden wake-up call and is launching a price offensive on leisure destinations from Geneva, but this might not be sufficient to regain lost ground.